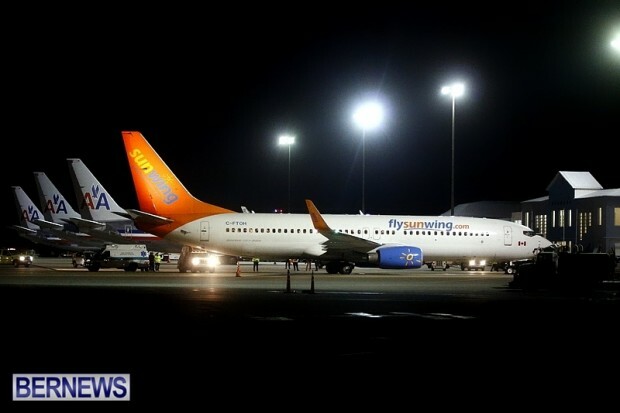 [Updated] At approximately 9.00pm last night [Feb 1] a Sunwing flight on its way from Canada to the Dominican Republic diverted to Bermuda after three passengers created a disturbance with flight attendants. The three people were taken off the plane, and escorted by Police Officers into the Airport Police Station where they remained for over four hours. The three people remained in the Airport Police Station for about 4.5 hours, exiting at around 2.30am this morning, where they subsequently caught a taxi to a local hotel. 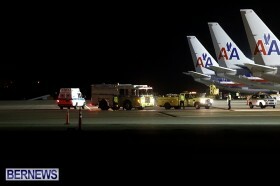 In addition to the three people the rest of the passengers on the airplane also disembarked, and were seen coming out at about 2am. The group — which appeared to be over 100 strong — all caught taxis to local hotels. 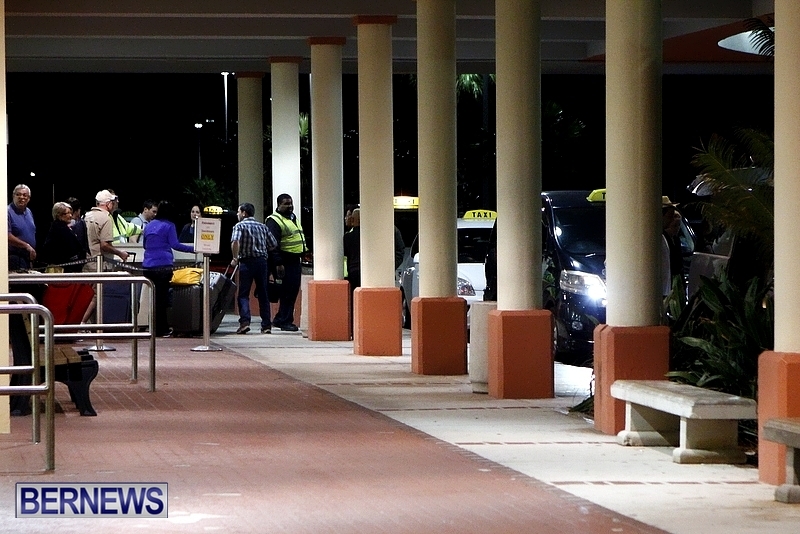 There was a minimal supply of taxis available at that hour, and some taxis were seen returning to collect a second group of passengers, and some of the passengers were seen still waiting for a taxi after 3am. The flight — which was en route from Halifax, Canada to Punta Cana, Dominican Republic — is understood to be rescheduled for today. It remains at LF Wade Airport as of 9.15am this morning. Update 5.10pm: The flight left the island at around 4pm heading to Dominican Republic. According to the Canadian media, the people were arrested for smoking on board the flight. CBC reports the family has been ordered not to leave the island and their passports and travel documents have been seized by the Bermuda police. The unruly passengers should have remained in custody!!! Lets pay people to get on every full 747 flight and act up as the planes get close to Bermuda. In a year we can increase our tourism figures andf fill some hotel beds! You might be on to something. Too bad the idea did not come up during the PLP tenure. They would have loved it. Imagine, DOT hires professional ‘act ups’ to fly on wide body (not fat people) flights that come near Bermuda but going to some other tourist destination. When approaching the Bermuda area, the ‘act ups’ (plenty are available here), start performing, forcing a diversion to Bermuda. Perfect! Its late, the airport closes or FAA regulations prevent the crew from continuing. Hundreds of passengers stuck here at least for the night pay out tens of thousands to hotels. Government gets departure tax. PLP gets to claim better tourism numbers. The PLP would have loved it. Even with the PLP out of power you people continue to demonstrate your skill at making $#!+ up that just isn’t there. This is one bigoted goon and I don’t even think he realizes it… People see through your comments and it paints a clear picture of your disposition. Quite frankly it disgust me! What do you think about the PLP supporters comments advocating for violence against those that they oppose? Plenty of examples for you to rail against, but yet you stay silent. Interesting…. Another graduate of Bermudas’ public school system. Can’t even recognize sarcasm when it is slapping him in the face. No sense of humour either. Yes a proud graduate of Bermuda’s public school system and the Georgia State University system thank you. Maybe you should take a look back at all your posts, sure some are sarcasm some not, but most with that same underlying (I Just can’t say it) message. It turns my stomach to think that your kind live amongst us. Georgia State? Couldn’t get into clown college? Unfortunately affirmative action allowed you the last available placement. My “kind”. My “KIND”!! You might want to elaborate on precisely what you mean by my “KIND”? That sounds extremely racist. There are plenty here who would be howling “racism” & “insensitivity” if they were lumped into a group of a certain “kind”. Maybe you need to look into a mirror & see what “kind” you belong to. If you don’t like my opinion, so be it. I don’t really care. Nobody forces you to read. There are certain very wordy bloggers who are not worth reading in my opinion, so I don’t. You might want to do the same when you see my posts. My feelings will not be hurt. And like I said further up, you “Clearly don’t even realize it” was just confirmed by your last post. Remained in custody for what? Just wondering if these passengers were drunk. take all the spending money. one way to boost tourism figures. Agreed with Awake, the culprits should have been held at her majesty’s custody! Hopefully they’re shipped back from whence they came. It will be an expensive holiday for them. The costs to the airline and inconvenience to the other passengers, I hope they are dealt with appropriately! Let’s see if any drugs and guns came off that flight. Ha! You sound so stupid. You really think that got through security in Canada. Simple! Think! If your going to domanican republic you can carry weed and guns on the plan. Both places are legal to do so. If the plane stops here anybody can be carring the drugs or guns. Remember all the passengers got off the plane. All it takes is for a person to know that all planes traveling in the atlantic has to divert to bermuda for a disturbance in mid air flight…………… Or maybe be your right I’m stupid. You are one Stupid Mother F%^. People don’t take drugs to DR, they take money. Then they attempt to find away to get the drugs out of the Country with the cash they use to pay for it. A lbs of weed in Dr is $400 give or take. Ask any street dealer in Bermuda how much that same 1 lbs will go for here! Trust me when I tell you if you get caught in DR trying to smuggle drugs out you will not be going to Hotel West Gate. LOLOLOLOL and you better learn to speak espanol while there beating off your a$$ with the back of a aka. 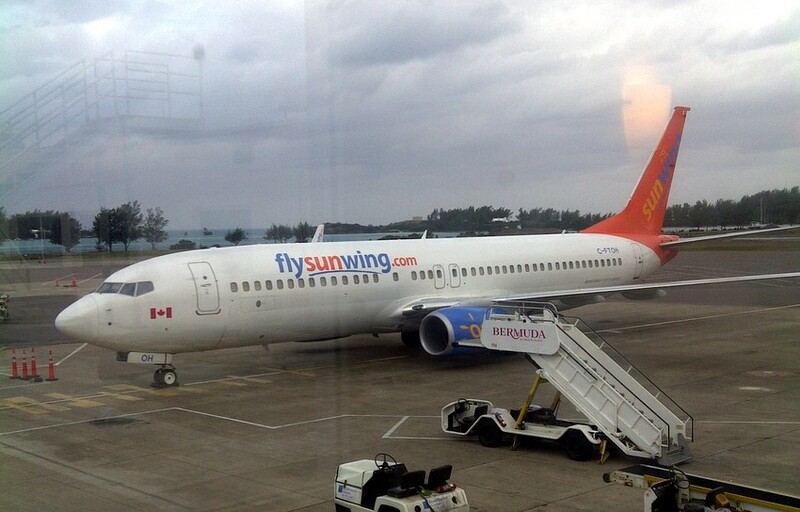 A job well done by the Sunwing pilots and flight attendants. As expected they made their passengers safety a priority. I’m certain that this will result in a hefty fine..don’t see why bermuda would receive the funds though..has nothing to do with us. They didn’t say anything in the rort about the plane being over 24 hours late in the first place. Funny how they leave certain things out. How much Head Tax does Bermuda collect from incidents like that? At two a.m. do people have to get off the plane? I think its great they got to take in the beauty of Bermuda on day like today albeit short. Perhaps a few will take pictures and decide to return. As a worker at the airport who worked the diversion late into last night and today, the passengers that where put out by this unfortunate incident had nothing but praise and thanks for the hospitality and help they received. They where shaking our hands and thanking us as they boarded the flight out to finally start there vacations. I would’nt be surprised to see some of those faces on our shores again. What is wrong with all of you! You are selfish! Every time something happens, the of lot of you and yes mostly you OBA supporters make lite of unpleasant situation. Where is the Bermuda spirit of welcoming! For all of you, remember how your parents acted if indeed you are Bermudans in the first place! Reading some of the comments proves there are more idiots than the 3 on this flight. Some people really got shortchanged in the brain department when conceived. These diversions do NOTHING but increase fares because SOMEBODY has to pay for these fools actions. It turns out to be the rest of us. Let’s give credit where credit is due. It was under the PLP government that suspicious people started arriving here in the middle of the night. You people who want to thank the OBA for these extra visitors better think again. Why were there 3 AA planes in last night? Two to Miami, one to New York. They had two Miami flights because it had been cancelled the day before. There is no departure tax on diversions such as this. In fact, the passengers are not even legally landed in Bermuda because to do so will make them the responsibility of the Bermuda Government. Agreement must be reached with the airline to assume all liability of repatriating these passengers from Bermuda. There are a variety of reasons why the passengers would have had to disembark at 2:00 am. The most likely being thay the crew were out of duty time and could not legally take off. The second being that the aircraft landed overweight and had to have a special sign-off by a certified nechanic. None exist here in Bermuda. So a little boost to the economy – but the taxi drivers did not want so much of it!! Try finding a taxi in the wee hours – thought they had to be on the road so may hours a day!! They need this GPS thing so they can be held accountable for the rules governing them!! in the voucher spaces – and they are not displaying vouchers!! THANK YOU BEEN THERE DONE THAT. Bet the 3 were drunk, should have had the “jay bird” in before Canadian customs & drank a Dark n stormy on the flight, then would have slept to the end . I feel sorry for the Crew & other passengers ! Why are there three American Airlines planes at the airport at the same time? Hi, I’m a girl who had 2 parents on this flight. I too am from Nova Scotia and posting from my window while watching the snow fall against the screen. They actually did forget to mention that the flight was delayed by 24 hours while waiting in Halifax due to inclement weather. Though the flight did land in Bermuda I was talking to them from their hotel and they told me they were actually kind of happy to have the flight diverted. They took this layover as an opportunity to be tourists and see the local sights. They never got to dip their feet in any water yet but they spoke so well about all the locals and scenery. Their insurance also paid for the amenities such as drinks and food. All in all their trip was delayed somewhere between 36 and 40 hour, and they only have 7 days. You guys want to know what the end result is now? Were now planning a family trip to Bermuda this time next year . I thank all you Bermudians for the great hospitality my family has received from you! You are talking rubbish, there are very cheap places to stay in Bermuda if you stay away from the big hotels. There are now many guest apartments to rent that are basically homes away from home and many are under $150 a night and includes full kitchens, telephone, internet and some even have washers and dryers. So “been there” don’t open your mouth unless you know what you’re talking about. i do know what im talking about so you check the internet. all inclusive to the republic 599.00 a person for 7 days at a 4 star hotel.